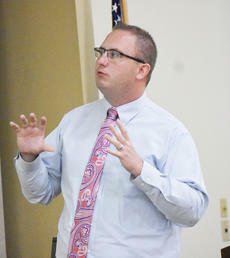 Daniel Cook speaks to the Alliance for a Better Community about drug overdoses in Taylor County last week. Drug overdoses do not discriminate, and they are on the rise in Taylor County, around the state, and across the nation. That was a portion of the message Taylor County Coroner Daniel Cook gave to local healthcare professionals during a meeting of the Alliance for a Better Community at the Taylor County Extension Office last week. In Taylor County, there were four overdose deaths in 2015, seven in 2016, eight in 2017, and there have already been eight in 2018, with a couple pending, Cook said. The statistics can’t be fully accurate though, Cook said, as there have been several instances where people have died in other circumstances, but drugs have been found at the scene. Around four people die per day in Kentucky due to a drug overdose, Cook said, and the largest demographic affected by overdoses are adults ages 35-44 and 45-54. According to recent reports, 1,565 people died of a drug overdose in Kentucky in 2017, up 161 from the previous year. In 2018, an estimated 80,000 people in the United States will die from a drug overdose, which is more than the populations of Taylor, Adair, Green, and Marion counties combined. Nationwide, that would be around 220 deaths per day. Cook connected a rise in suicide deaths locally with the rise in drug use. Cook said heroin is one of the larger problems he sees, but it isn’t the only one. Cocaine and methamphetamine were also attributed to overdoses in Taylor County last year, but one of the bigger problems lies with abuse of prescription medications. Cook concluded by offering a challenge to those in attendance. He said that knowing 80,000 people will die this year from drug overdoses, people should be more inclined to do something to stop it.